El Monstero performing at Hollywood Casino Amphitheatre. Photo by Keith Brake Photography. 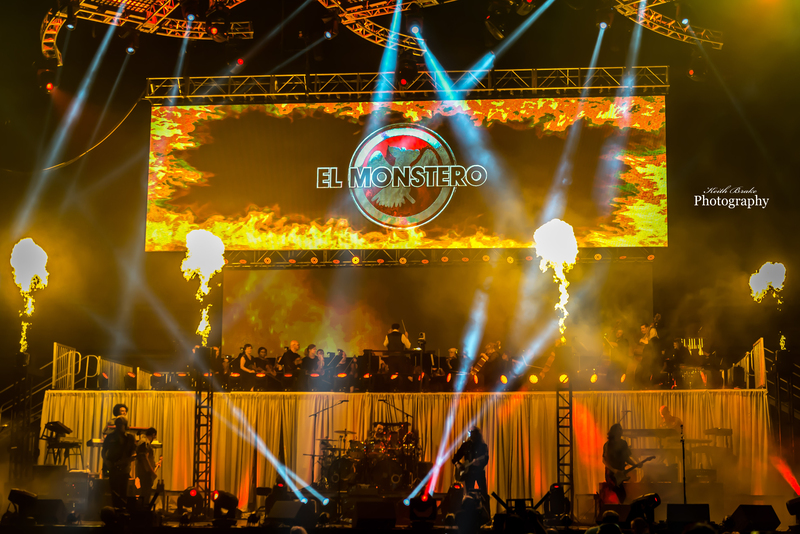 This past Saturday night the phenomenon that is known as El Monstero collaborated with the Saint Louis Philharmonic Orchestra for a performance that will not soon be forgotten. 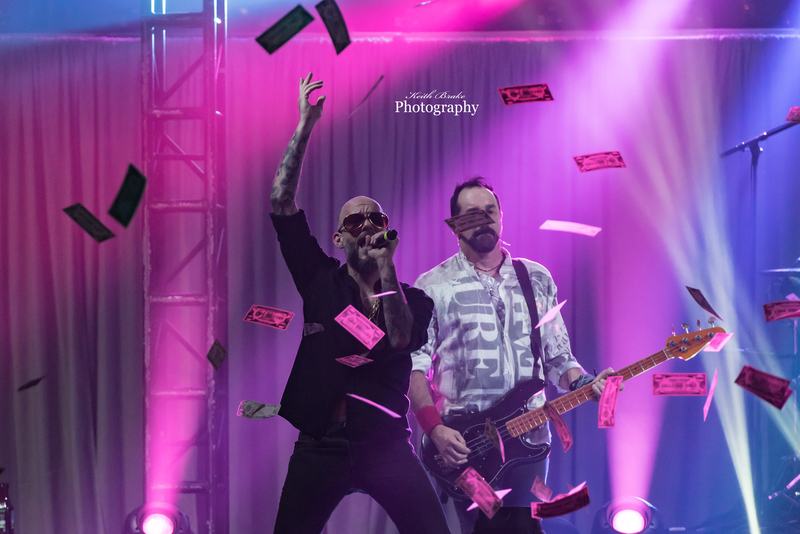 All the aforementioned elements of grandeur were on display with little reservation as Saint Louis’ favorite Pink Floyd tribute gave those in attendance way more than their money’s worth. The evening started with the Philharmonic Orchestra playing a few numbers for the ever-growing crowd, which was quite appreciative of the seemingly effortless nature of their performance. Robert Hart Barker (Conductor) turned to bow in appreciation of the powerful applause from the anticipatory crowd more than a few times throughout their opening set. As the sun set on the amphitheater the crowd had filled the venue to near capacity and the atmosphere was tangible. The house lights dimmed and the experience began. I categorize Saturday as an experience because calling it a “show” or “concert” would fall painfully short of appropriate for what was in store for those in attendance. “Welcome To The Machine” was the first selection of the evening and from the moment the Fascist Soldiers (actors Of course) stepped onto the stage the crowd was electric. This song also played host to a guest vocalist, Moon (Philip Sneed) from Greek Fire and Story of The Year. Moon took the stage with charisma and played into the experience perfectly then proceeded to deliver a powerful and authentic performance for this iconic song. 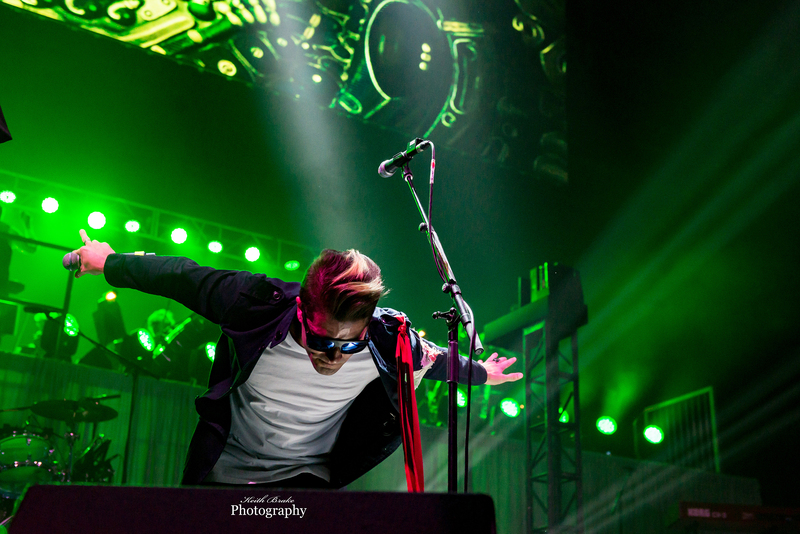 Moon performing with El Monstero at Hollywood Casino Amphitheatre. Photo by Keith Brake Photography. The evening was littered with highlights, too many to count to be honest. One moment that sticks out to me was the performance of “Wish You Were Here”. This song was to be dedicated to fallen family members, El Monstero fans and anyone else whom had been loved by someone in attendance that had taken too soon. The Graphic screen displayed pictures of the fallen throughout the entire song, which was performed with the whole band sitting at the front of the stage. As one would imagine, a powerful and sentimental moment in time that produced some misty eyes. El Monstero is a true tribute to Pink Floyd, not just a “cover band”. They pay homage to everything that is Floyd, spot on vocals, awe inspiring light shows and musical acuity akin to Waters and Gilmour themselves. The group has been treating the St. Louis area to this quality experience since 1999 when they played their first show at Mississippi Nights. The addition of the Philharmonic Orchestra only added to the power and magic of the event, something that I would request be done again if anyone would be willing to listen. The two musical units came together flawlessly and it was truly a special moment to witness. El Monstero will be performing again in Saint Louis this fall at The Pageant. I would recommend to anyone who likes Pink Floyd, even as a casual fan, take in this event. My advice would be to keep an eye on the concert calendar because this will certainly be a hot ticket. The thirty nine song experience was strong and magical and for those in attendance it was just enough to leave them wanting more. Go check these guys out at http://www.elmonstero.com for your chance to experience the magic that is El Monstero.